In his new work Buona Fortuna, Jorge Mañes Rubio transports us to the mountains of the Parco Nazionale del Cilento in the south of Italy, where several isolated villages were abandoned after a series of devastating earthquakes and landslides. 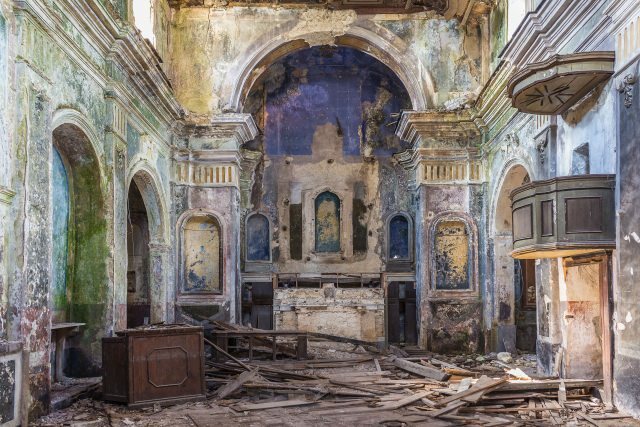 Hidden among these ruins, and despite all the decay and destruction, several churches and chapels reveal themselves in all their glory. A closer look into Rubio’s photographs expose empty altars and pedestals; in fact, all the relics are missing. This is a direct consequence of the looters and art merchants who didn’t think twice about breaking in and removing paintings, sculptures, and other sacred relics. Despite all the emptiness and disrepair, Rubio manages to capture these places in all their beauty. A tragic, sublime, almost surreal representation of a fragile yet astounding legacy. With his large-format colour prints, the artist invites us to walk into an ephemeral world where grandeur and decadence clash together. A conflict that draws the viewer into a deeper reflection about the value of these contemporary ruins, and ultimately the meaning of them. Buona Fortuna is not asking for reconstruction nor restoration of the churches, but to preserve them as what they are today: truly works of art. Rubio is currently busy trying to get all the permissions and funding to reopen some of them to the public. 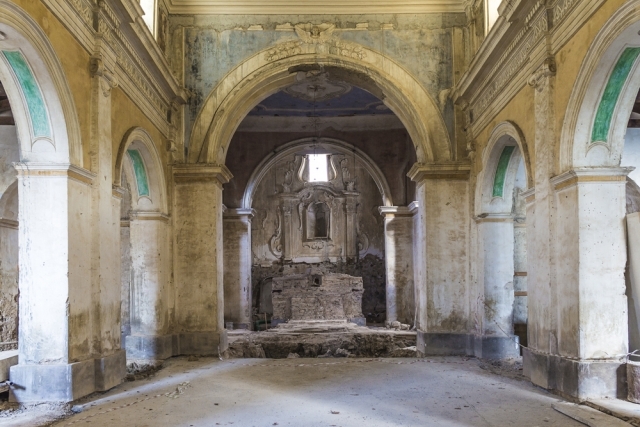 His plan is to create a series of new artworks and installations that will replace the stolen figures, transforming these abandoned places into new cultural scenarios. But for now, his photographs have brought to life places that we couldn’t even dream of.